Those of you not on Facebook may be interested to know that I’m now over 10k words in this year’s NaNoWriMo novel. Then again, you may not be interested at all, but NaNoWriMo will likely be the subject of Fiction Friday posts during November. Just to bring you up to date, I wrote 3,193 in three and a half hours on November 1. A two-hour writing block on November 2 yielded 1,972 words, bringing my total up to 5,165. A very productive two and a half hours yesterday generated 2,873 words and upped my count to just over 8k, 8,038 words to be exact (which I am during NaNoWriMo). Today I topped 10k by writing 2,505 words in two and a quarter hours. I’m sitting pretty at 10,543, which is 543 words above my goal for today. Next week may well be a completely different story. My schedule is packed with commitments, deadlines, and dinner guests. 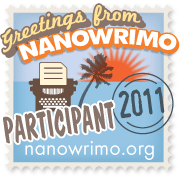 We’ll see if I manage to maintain NaNoWriMo momentum.